For background information about our Oregon trip, it would be helpful if you first read Oregon (including an off-the-itinerary story). Day 1 of Bill's and my July Oregon trip. 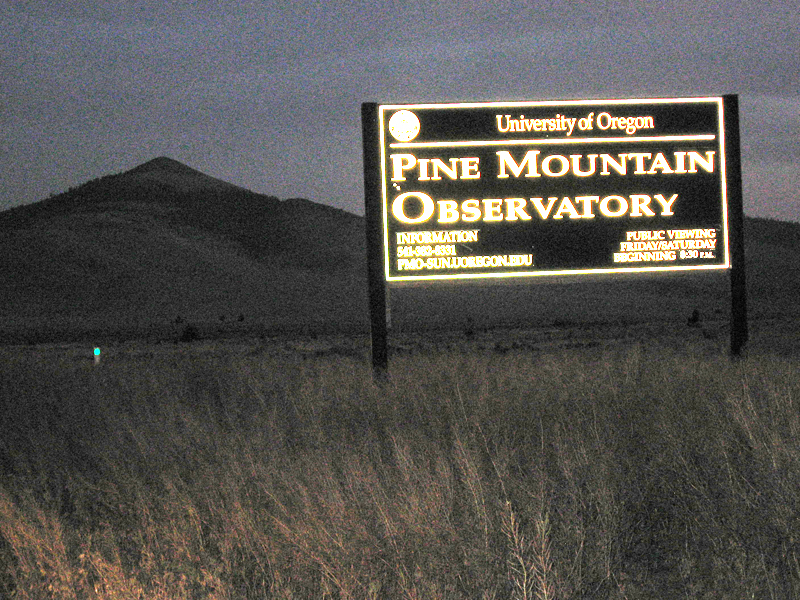 "Pine Mtn 6,509" is at the end of the hot pink marker line that indicates our observatory side trip. Click photo once, and again, to enlarge. At dusk we drove southeast from Bend, approximately twenty miles on pavement. Then, another eight miles on a winding dirt road out in the middle of nowhere. At two or three points, just as we would get around a curve in the road, we’d see a few cows standing in the middle of the road or on the shoulder, owning it. We’d stop, put the windows down, talk to the cows standing next to the car, and continue driving until the next group of cows. 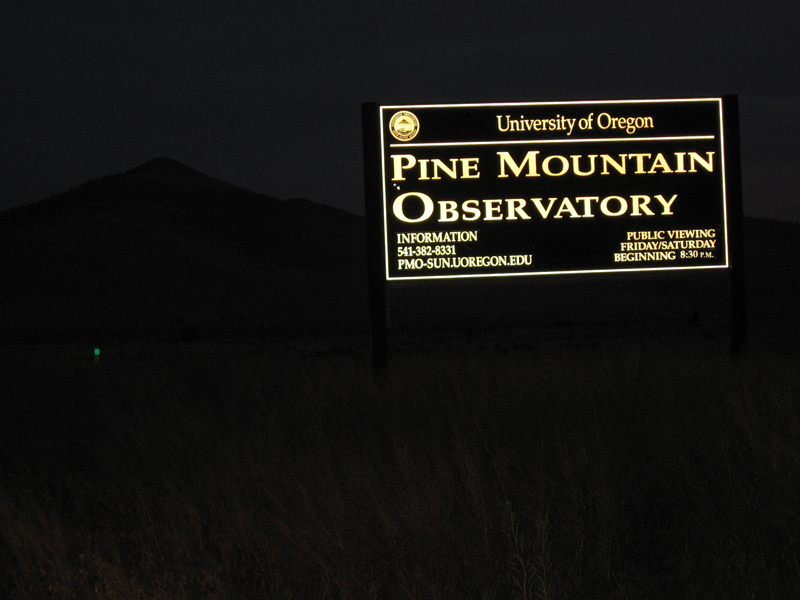 Around 9:00 P.M. we arrived in the dark at the Pine Mountain Observatory. Earlier in the day on the phone, a man at the observatory encouraged me to bring a flashlight with a red filter (or purchase a red filter at the walk-in-closet-sized gift shop that evening). Understandably, they didn’t want white lights affecting the viewing of the sky. When we arrived near the top of Pine Mountain (peak elevation 6,509 feet ****), a volunteer’s lecture for perhaps thirty people was taking place inside a large tent. The lecturer was animated explaining about the heavens. It was dark in the tent except for the light on the screen from the projector, the lecturer’s laser pointer, and a few LED-type lights so people wouldn’t trip over chairs, etc. We then walked a few hundred feet (with porta-potties along the way) to a higher elevation (approximately 6,280 feet *****) where we were allowed to look through the observatory’s 24″ telescope. In addition, we were encouraged to look through three or four privately owned telescopes as their amateur owners explained what we were viewing and what they were researching. The ambience of the setting allowed us to be immersed in the mysteries of the heavens. * The Central Oregon Visitors Association web site is also helpful. *** We were on the upper story and had a river-facing room, which is what we would request again. We had dinner on the resort restaurant’s terrace overlooking the Deschutes River. Bill and I split the Black Angus Filet Mignon with Port Wine Reduction. This was the best restaurant-prepared steak I remember ever having. 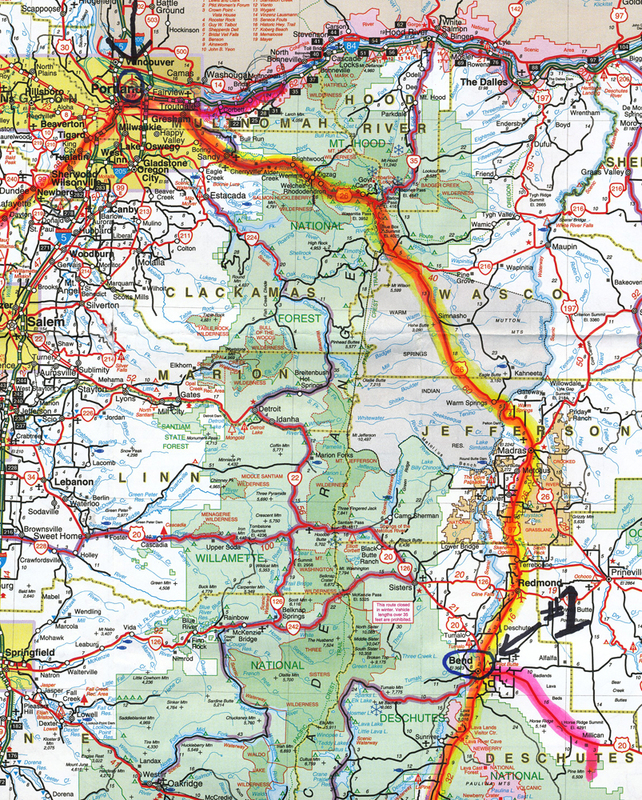 This entry was posted on August 9, 2009 at 10:15 pm and is filed under Oregon, Travel. You can follow any responses to this entry through the RSS 2.0 feed. You can skip to the end and leave a response. Pinging is currently not allowed. It’s so great to hear about your trip! Normally, we wouldln’t have time for you to go into detail, so this is fascinating. I don’t know that I would have ever thought to go to an observatory. Kudos for the idea! My favorite parts (on this post) are the map (looks so real and personalized), about your talking with the cows :-), the best restaurant-prepared steak you remember having, and your last line: “The ambience of the setting allowed us to be immersed in the mysteries of the heavens.” Mmmm.